Personally I think it has been a bit spoiled by that damn second seat. 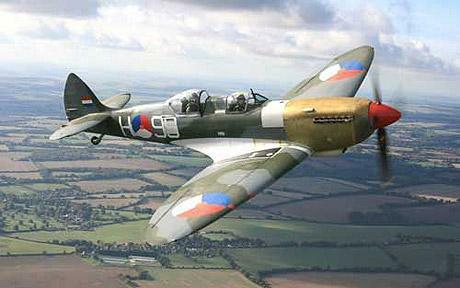 Oh well, it is still a Spitfire in a manner of speaking and if I were that wealthy I’d still want to own it. Along with the ME-262, the ME109, FW190 and of course the Hawker Hurricane. I’d also love to own the civilian private plane once called The Air Coop. I think I have the spelling right. I’m certain it is no longer made. I saw one around 1957 I think it was. Never forgot it and yet it wasn’t anything special and nothing fancy about it. But just something about that plane that stuck with me all these many years. Oh yeah .. The P-38 and The Mustang and The Corvair and did I miss anything? I did. The old twin tailed, no it had three didn’t it? TWA flew it and I think it was designed by Howard Hughes. ?? Was it called the Clipper? What a sweet looking aircraft that was. I know PanAm had a Clipper. DArn, now I have to find a good photo of that TWA plane. There were a lot of em once. About this plane here, The Spit. Looks like they’ve also screwed up the bullseye markings too. Hmmm, maybe I’d offer only half. Why’d they have to mess with the markings? What made the ppl who restored this think replacing the original markings was cool? I’m off on a tangent here. I see one plane and it sets off my memory banks. It’s the first of its kind to be offered at public auction for more than 20 years and has been painstakingly restored to airworthiness over a five-year period. “The warbird is absolutely ready-to-fly and in truly sparkling flightline condition,” said a spokesperson from Bonhams auctioneers. Originally it was a single-seater but it’s been refitted to take a passenger. This was a ‘Bubble Canopy’ MK XVI, considered by collectors as being less desirable than this two-seater MK IX Spitfire. James Knight, MD of Bonhams Collector’s Motoring Department which is managing the sale of ‘G-ILDA’ said: “We are greatly honoured to be entrusted with the sale of such a distinguished and historic aircraft. “As Bonhams is the last of the great international fine art auction houses to remain under British management, the sale of an aircraft so linked to the history and very survival of our nation has enormous significance for us here. "The sale will be at the RAF Museum, Hendon, London on 20th April.